The LightWave 3D® Group, a division of NewTek, Inc., opens the door to a new era of creativity for artists, animators and designers working in 3D with the release of LightWave 2015 3D software for Windows and Mac operating systems. LightWave 2015 offers many new workflow enhancements and features that are designed to streamline a variety of pipelines—from visual effects, motion graphics, and game development to architectural visualization, product design, and advertising and marketing. With the release of LightWave 2015 comes new pricing: $995 for a full license and $495 (USD) to upgrade from LightWave 11.x or earlier. LightWave 2015 introduces new features that are ideal for character animation, visualization, dynamic simulations, and more. It also extends the functionality of popular features like the Genoma character rigging system, Bullet Dynamics, dynamic parenting, rendering enhancements, and more. Bullet Constraints: Take control of dynamic simulations with new constraint types such as Point-to-Point, Hinge, Slider, Cone Twist, Spring and six degrees of freedom (DOF) constraint types. Whether it’s a car rolling over a terrain with fully working suspension, or a rag doll falling down the stairs, constraints help make the movement believable. Importance Sampling: Greatly improve the quality of scenes lit by GI and HDR images or background lighting. Importance sampling intelligently concentrates rays into important areas and eliminates the noise and splotches that arise from highly differing light intensities for cleaner, more predictable renders. Match Perspective Tool: Whether matching plates or simply placing objects in photographs, matching the camera position and rotation can be a time consuming process. The new Match Perspective tool can quickly sync the LightWave camera to an original photo or plate. Genoma 2 Character Rigging System: This rapid modular rigging system, which at the base level is a complete rigging development kit (RDK), can be used to quickly rig characters for animation without the need to set up complex rigs from scratch. Genoma 2 can create expert rigs and generate custom presets that perfectly fit into any character animation pipeline. 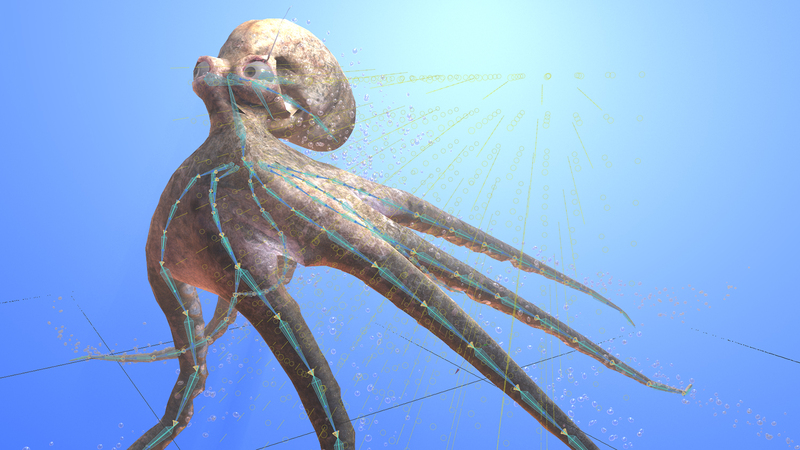 It supports the use of Math Expressions and Scripts and includes new and improved human, feline, and arthropod preset rigs. Edge Rendering: Intersection Edges can now be drawn where geometry intersects on the same object and/or separate objects, allowing for more creative control over cel rendering. Use Patch Border Rendering to make Sub-Division patch borders visible in the renderer with the click of a button. It is perfect for modelers who want to showcase their mesh topology combined with the full render. Edge Buffer can be used to render all edges into their own buffer, allowing for post-process manipulation in a compositing software. 64-Bit QuickTime Support: Loading and saving Quicktime movies is now possible to those using 64 bit versions of LightWave for Windows. LightWave 2015 includes new enhancements to the Viewport Preview Renderer (VPR) and introduces many new features and improvements such as Interactive Dynamic Parenting, Textured Falloffs in Modeler, Fiber FX, GoZ Multi-tool and Unity 5 support, and more. It also supports the latest interchange formats such as Alembic 1.5 and FBX 2015. LightWave 2015 for Windows and Mac OS is now available and priced at $995 (USD). Registered LightWave 11.x or earlier users can upgrade to LightWave 2015 for $495. Educational pricing is also available. Visit Safe Harbor for more information and to purchase. Download a no-cost 30-day full-feature trial of LightWave 2015 at www.lightwave3d.com/try.